​Cityjazz (one word) is a 501 (c)(3) non-profit organization whose mission is to bring the jazz musical art form to the public in​ a manner that is meaningful, educational, entertaining, and affordable. Cityjazz is a 501 (c)3 non-profit organization, featuring the Cityjazz Big Band, Utah's Fabulous Jazz Orchestra. The band performs for and supports many community events, has been the headline group for Utah's Arts in Education and the MountainWest Arts Conferences, and has performed for the Excellence in the Community concert series in Salt Lake City. ​Cityjazz is a 501 (c)3 organization, and donations are fully tax-deductible and greatly appreciated. Booking and contact information is available on our contact page. The big band and combos are available for events. Discounts are available for nonprofit organizations. ​Sponsors and donations are tax deductible. Cityjazz would like to thank the Salt Lake County Zoo, Arts and Parks (ZAP) for their generous support. ​The Cityjazz Big Band will perform for the Millcreek Venture Out series on July 26. Combo at 6:30 p.m., Big Band plays at 7:30 p.m. Visit www.ventureout.org for more information! ​Visit our Spotlights page, a special focus on Cityjazz members and community events and programs. Our Current Spotlight: Brigham City, Utah. 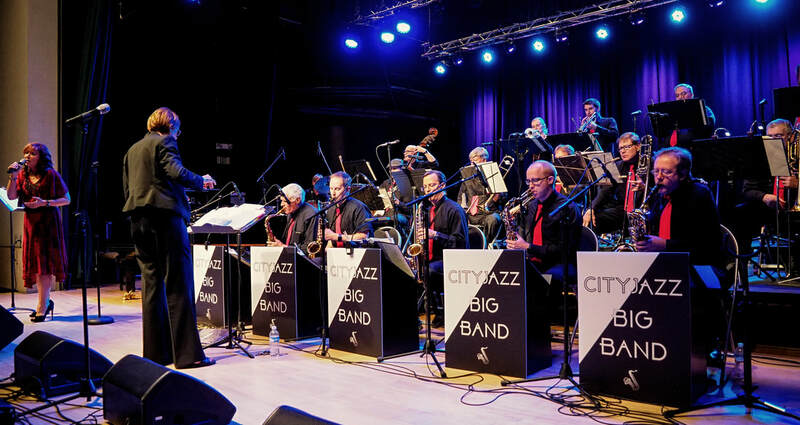 © CITYJAZZ AND CITYJAZZ BIG BAND, 2018. Unauthorized use and/or duplication of this material in whole or in part without express and written permission from this site's author and/or owner is strictly prohibited.